CEDAR CITY — One person was injured in a T-bone collision on Main Street in Cedar City Saturday afternoon. Cedar City Police responded to the crash shortly after 4 p.m. near the intersection of Main Street and 700 South involving a green Chevrolet passenger car and a white Dodge pickup truck. The driver of the passenger car pulled out into traffic where it collided with the pickup truck on southbound Main Street, Cedar City Police Sgt. Jerry Womack said. “A passenger in the green car was transported to Cedar City Hospital complaining of rib injuries,” Womack said. The driver of the passenger car was cited for failing to yield the right of way, Womack said. 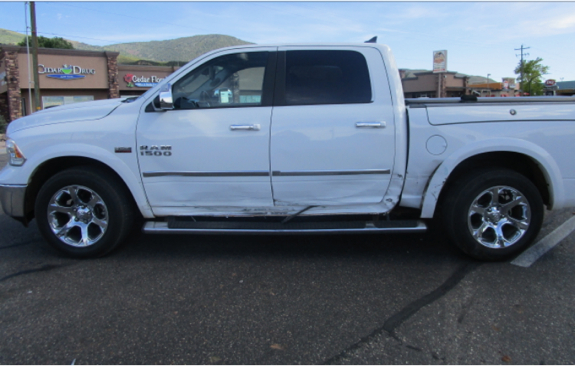 The Chevrolet’s front end sustained heavy damage, while the Dodge truck sustained minor damage to its driver’s side. Oh em gee, a crash on main street. Alert the press, oh wait, they’re on it. I’m sure there’s a ton of other happenings in that town to report on rather than some minor fender bender. The ivolved party (ies) must know someone at this so called news station. Gets worse everyday….. smh.